Fez Medina Morocco -- Rent Small Palaces, historic houses,dars, riads, villas in the souks of Fes Maroc. 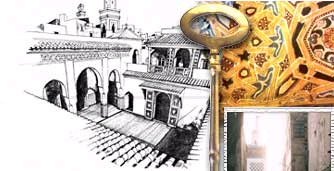 We will provide our guests with an exceptional experience of the invisible world of the medina of Fez, an encounter with Fez completely unlike that of a surface tourist. We avoid the scripted and the inauthentic. We seek out remarkable experiences in the medina that will remain with you forever. Please feel free to make special requests that will make your stay memorable. We will treat our guests with the highest standards of care and integrity. Our guests will be treated as family. Without exception, we respect the historic integrity of the sites we touch. Regardless of the value of the architectural and decorative elements in Fez Medina sites, we will never remove architectural treasures for sale on the international antiquities market. This is a growing issue in the Fez medina today, where a carved and painted ceiling removed from a historic Massriya can be sold in Paris for over $20,000. We promote the preservation of architectural and decorative treasures in situ, where they belong. We will renovate our sites using traditional materials and employing local artisans of top talent. We will promote excellence and authenticity in renovation of historic properties in Fez by recording and documenting examples of fine workmanship, and by promoting discussion and awareness of common restoration issues. We will join organizations such as Ader Fes and UNESCO in working toward achieving a popular aesthetic in the Fez medina where traditional zellighe mosaic is again valued above modern tile, where the lustre of oiled wood is preferred to a new coat of paint, and where traditional houses are valued more highly than modern ones. The Fez medina is a rare treasure, and we all share the responsibility to preserve it. Fez Medina, L.L.C. and others, both Moroccan and foreign, will "own" some of these historic sites for a relatively brief period in the lifetime of these houses. However, these buildings will outlast all of us, and we do not take our temporary ownership of these treasures to mean that we are their masters. Our commitment is to act as guardians of these remarkable places while they are in our care, to restore them and to make them stronger for the centuries ahead, and then to pass them responsibly to their next guardians. Tourism in the Fez medina has the potential greatly to enrich and preserve the medina, and to enhance the quality of life of those who call it home. We will enthusiastically promote the role of traditional houses in tourism in Fez. We recognize that private efforts in purchasing and renovating historic houses is critical to the preservation of the Fez medina, which contains many thousand private homes of historic interest. Each of these houses relies not on government or formal preservation activity but on the love and efforts of single families. We wholeheartedly promote responsible private ownership of historic medina houses among both Moroccans and foreigners alike. We recognize that the renaissance of the Fez medina, the return of old Fassi families to the medina, and the recent blossoming of foreign interest in purchasing historic medina houses will cause property prices in the Fez medina to climb. For many Moroccan families who already own houses in the medina, this will create wealth and opportunity. The rising prestige of the medina will aid in reversing the current trend of Moroccan families of means moving out of the medina to modern luxury villas in the nearby Ville Nouvelle. On the other hand, a rise in prices will make it more difficult for Moroccan families who do not already own houses to purchase a house in the medina. We are as troubled by this effect as we are enthusiastic about the Fez medina's revitalization. We move forward in our preservation activities without a satisfying answer to this problem, but with a strong commitment to operating in a manner that is ethical, conscientious, and respectful of both the medina itself and the people whose birthright the medina remains. A portion of each Fez Medina rental fee is used to restore common treasures in the streets of the Fez medina. These street-level treasures - from community fountains to historic neighborhood washrooms with vaulted ceilings and mosaic floors, to the cedar porticos that cover shop doors in the souks, are precious but too common to be protected by UNESCO or the larger preservation agencies. Seen and enjoyed daily by all in the Fez medina, the restoration of these street-level treasures will enhance the environment of the medina for everyone. The lion's share of the profits of this web site will support residencies in Fez and elsewhere in Morocco for contemporary artists from around the world, with emphasis on artists from developing countries. Writers, visual artists, musicians and composers from India to Venezuela and from New York to Viet Nam, together with their Moroccan counterparts, will be awarded merit-based fellowships to live and work in the Fez medina and in selected environments in the South of Morocco for short residencies of one to three months. Your support of this site will support our gift of time to established and emerging artists of exceptional talent.